Pyramid CRUD interface. 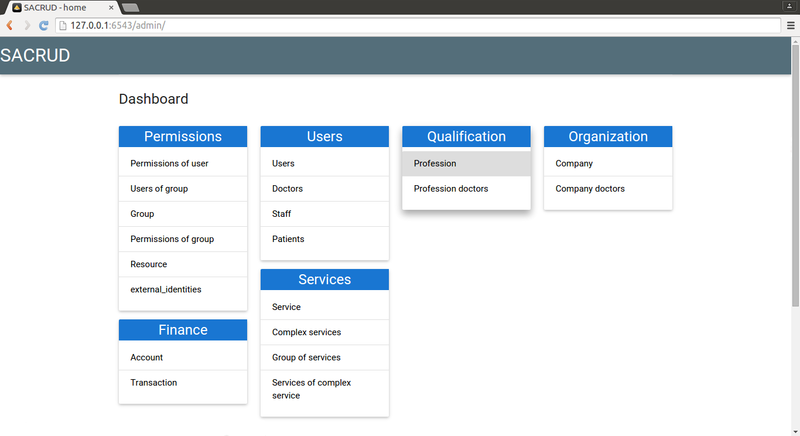 Provides an administration web interface for Pyramid. Unlike classic CRUD, pyramid_sacrud allows overrides and flexibility to customize your interface, similar to django.contrib.admin but uses a different backend to provide resources. New Architecture built on the resources and mechanism traversal, allows to use it in various cases. ps_alchemy - provides SQLAlchemy models. ps_mongo - provides MongoDB (doesn’t exist yet).